We have a airconditioned 1750 sqf library in the 7th floor of the academic building. It has got 4391 volumes of Reference books, Text books, Periodicals, Printed and Electronic version of National and International Journals. There are separate reading area for the students as well as teachers. It is also equipped with Internet access. 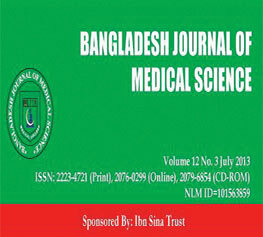 We have an Index Journal ''Bangladesh Journal of Medical Science'' which is indexed in several organization like Scopus Elsevier, Thomson Reuters, British Library, Hinari/WHO, Index Copernicus, Cross Ref. etc. Very soon this library will be shifted in a single floor of 8900 sqf area where seperate area for Male & Female students and Teachers will be provided. Our scientific journal 'Bangladesh Journal of Medical Science' is indexed in INASP (UK), Index Copernicus (EU), HINARI/WHO, EBSCO Library (USA), DOAJ (UK), Cross Ref and DOI.